Whatever drawing style you choose for yourself, in any technique drawing the human figure involves maintaining the correct proportions of female and male body. The proportions allows you to create beautiful and realistic drawings that speak of the skill and professionalism of the artist. So, if you decided to learn to draw the human figure, you need to know exactly how the relationship between different parts of the human body, and what is the difference between the proportions of the female figure from the proportions of the male figure. Draw on a sheet of paper a vertical line, the upper point of which coincides with the top personand the bottom with the feet. Divide the line into eight parts – each part is equal to the height of the head of a man. The widest part of the figure is two whole and one third of the width of the head. Using as guide lines established subsidiary labels, start to paint the figure of a man, given the ratio of the parts of the body. The waist always needs to be slightly wider than the head, and the elbows are in line with the navel. The lower edge of the knees placed on a distance of one quarter of the figure from the point of the feet, and draw the shoulders at a distance of one-sixth of the points of the crown. Drawing female figure, remember that it is much narrower and sleeker than the male figure. In the widest part of a female figure equal to the width of two heads. The width of a woman's waist is equal to the width of one head. The anterior surface of the thighs in women is wider underarms, and back – already. Men's hips are much narrower for women. Place the navel on the female figure below the waist, and keep the elbows slightly above the navel. All these factors make the female figure distinguishable from the male. 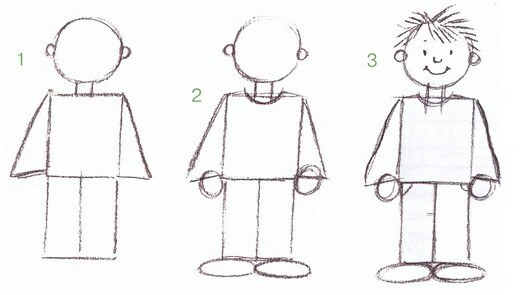 Try to draw a female and male figure in different angles – front, back and side. This will allow you to get the most adequate idea of the proportions and their combinations. To draw woman pencil, you will need knowledge about the structure of the human body and the ability to work in graphics technology. Drawing of a female model must be written in neat, flowing lines and soft shading. Select the model for posing and put her on a chair, sofa or armchair. You can draw a woman in a long evening dress or to portray her in a cozy home atmosphere, for example, with a book in his hand or a blanket. Think about the lighting that should highlight the model. Equip your workplace. Select the appropriate view. Take a large sheet of paper and attach it to an easel or other smooth surface. Next lay out pencils of different softness, eraser, a few small sheets of paper that you'll need to outline. Carefully review the model. To find a good composition, make a few sketches on a small sheet of paper. Define the main proportions and apply them on the paper barely visible lines. Label the head, torso, arms and legs. Below figure had the highest similarity with the original, it is important for you to grasp the characteristic features of the model and try to convey it on paper. Discuss facial features and hair. At first thin lines mark the eyebrows, eyes, nose and mouth. Determine the correct proportions. Then draw all the facial features. Don't forget the hair. If they styled – try to transfer it on the paper, flowing hair will draw the curls. Carefully draw the neck, shoulders, hands. Mark clothing and existing accessories. If the model is portrayed in the interior, it needs to be transferred schematically. After you have completed the drawing of a woman, proceed to the elaboration of the volume. First, take a medium soft pencil and stroke of the shadow. Solid pencil draw part of the face, some curls, draw folds on clothes. The strokes should highlight the shape and to convey the texture. Don't try to shade the whole figure a light place, you can leave the study with a pencil. In the end, take a dark pencil and highlight some parts, such as eyes, a couple of curls, folds on the clothes. Your work will become completed. Drawing pencils you can choose tinted paper. 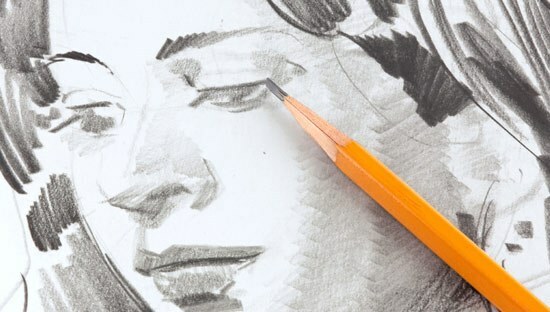 Learn to draw portraits – an important achievement for the artist. Having mastered this subtle art, you will be able to confidently manipulate sanguine, charcoal, tempera, watercolor or oil. But better to start with a pencil sketch. Surely in terms of a simple stylus, you will achieve remarkable similarities with the original. paper napkins or cotton pads. Attach to an easel, or tablet sheet of loose paper for drawing. Sharpen the pencils. Choose the right photograph that will serve as a model for a portrait. Better to start with a person located full-face or half-turned. Don't take portraits with a lot of difficult to draw the details. The image of beards, moustaches, glasses or numerous wrinkles – work for an experienced artist. Mark Fox auxiliary grid. Draw a rectangle the size of the corresponding face of the future. Draw a vertical line dividing it in half. 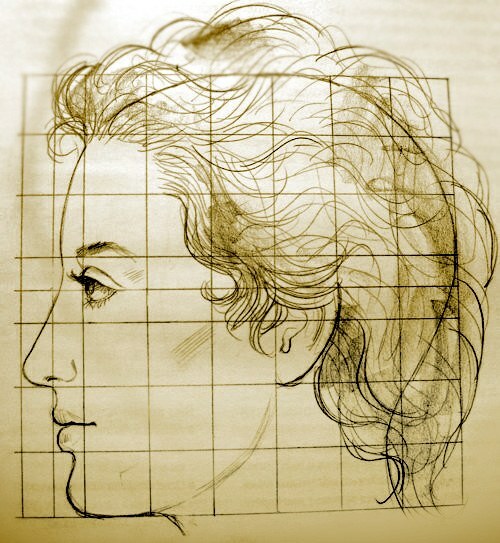 Draw three perpendicular – the first will set the eye line and the second the tip of the nose, and the third is the place where will be drawn the lips. Referring to the photo, draw the outline of the face. Pay attention to the shape of the chin and full cheeks. Mark the contours of the nose and eyes and eyebrows. Follow the symmetry of the figure, focusing on the vertical line dividing it in half. Draw cheekbones and eye sockets, otherwise the face will look flat. Soft pencil , scroll to the nostrils, contour of the eye. Darken the pupil and draw the eyelid. Indicate the contour of the lips. Examine the drawing and erase construction lines. Future work continue with a soft pencil. Cover the face with subtle touches of pencil lead and RUB it with a paper towel or cotton pad. Proceed to the imposition of the shadows, forming the relief of the face. Darken the crease of the eyelid, temples, the inner part of the eye sockets and the sides of the nose. In the area of the nostrils amplify the push of the pencil. Trace the outline of the eyes, shade the iris and the pupil put in the white highlight the corner of the eraser. Trace the outline of the mouth. Make the upper lip darker, in the middle of the lower light deliver glare – it will give it volume. The area of the eraser slide along the back of the nose narrow white strip. Subtle touches of the pencil mark the shadow in the corners of the mouth and under the lower lip. Start working on the hair. Mark the line of parting and draw strands, taking the pencil from the parting to the ends of the curls. Change the pressure of the pencil so the color turned out uneven. When you are finished, go over the hair with a cotton pad, shading touches. On top of restoroute spend more how pencil lines. Stroke the curves of the curls and again RUB the stylus. Area eraser vysvetlit the glare on her hair, taking it from roots to ends. Put a shadow under the chin, outlining the neck line. Examine the illustration and swipe the remnants of the stylus. The portrait is ready. Drawing faces is a complex art. Some artists can cut out of black paper with the person's profile without any sketch. Such perfection they reach. But first we need to learn how to draw human face in this perspective. Before something to draw, analyze and decide which of the geometric shapes of the object can be entered. For the human head in profile will fit the square. Draw it on a sheet of paper. The paper can be in any format, even standard. Do not use a ruler while drawing, all the relationships and try to determine by eye. The horizontal and vertical sides of a square divide it into seven equal parts. Draw the mesh. It is much easier to place all the proportions. The square will fit the whole head, including the protruding portion of the nose. Determine the ratio of the width of the head to the protruding part of the nose. Cut the required length mark on the same horizontal line. Put on this place the point. Using the marker draw a vertical thin line. It make the layout vertically. On one of the vertical sides mark the proportions. Define the eye line, eyebrow, nose, chin, mouth. The facial features are all different: someone very high forehead, someone has a large nose, and someone projecting chin. Because lines can be placed below or above the average. Mark the lip of the line that separates the second and first lower rows. But the place between the fifth and third rows of squares. Eyes should be level with the line located between the fifth and fourth, and the eyebrows slightly above the eyes. Determine the angle between the nose and forehead. Draw a line of the forehead. Mark the line of the nose, guided by the vertical line. Let's see how to converge the lower line of the nose with the horizontal direction. Mark's eyes. When the location of the face in profile, the eye of the observer does not seem oval, and resembles an acute triangle, which has a slightly rounded side that is closer to the nose. In the outer corner of the eye the lines of the eyelids. Brow line repeats the line about eyes, but it's a bit wider. The line between the lips and lower part of the nose swipe almost vertically. Draw a chin line. Remember the pit, which is always between the chin and lower lip. Sketch the hair line. Show the position of the ear approximately the middle of the head both horizontally and vertically. Finish the neck. The profile is ready. The image of a person will not cause difficulties if you draw, proportioning. They affect not only the body but also the human face. It is important to sketch step by step – first create the schema, and then to give it shape. Put a sheet of paper vertically. Departing from the upper and lower boundaries at 2 cm, draw a vertical line. Divide it into 8 parts by nine horizontal lines. Between the first upper and the second position the head. To do this, draw a vertical oval. The head occupied the upper gap. The remaining 7 will fall on the body and legs. These are the proportions of an adult male. In the second and third interval on top make an outline of his body from neck to waist. The second will draw the neck, then shoulders. Draw upper arms to the armpits. In the third period make a sketch of the human body from the armpits to the waist. Fourth, the proportion from the waist to the groin part. Fifth – it nearly to the top of the knees. The sixth ends with the bottom of your knees. It falls on the seventh calf, the eighth – on the lower part of the calf to the feet. Arms and hands draw from the shoulders to the sixth horizontal line, that is, they end up at the bottom of the fifth part of the scheme. Now go back to the circle. Divide it into 3 parts with four lines. On the border of the first and second lines to draw the eye. Above them the eyebrows. The second part is the nose. Draw a vertical line on either side of it put two dots are nostrils. In the middle third part of the draw of the lips. Draw the ears on the side, they are located on the line of the nose. Erase the auxiliary lines. Draw over the schematic image of a man his clothes, and on his head is hair. If you learn how to draw the man wants the child, then he would depict a woman. First, you need to draw a circle is the head. Let portray it 2 eyes, a straight nose and a mouth. Next, you need to put in the lower middle part of the head point. It's the pinnacle of an acute isosceles triangle. Let draws this figure. This dress women. At the top of the triangle, on either side, you need to hold two lines – the hands of a lady. From the base of the triangle out 2 straight lines and legs. A grown man can draw a woman more realistically. Make a face oval, round or triangular. In the latter case, a bit pointed to draw the chin and the upper part of the head may be rounded. As in the previous case, divide the outline oval of the face into 3 parts. The eyes consist of two lines – the top and bottom of the arc. Eyebrows the same shape as the upper eyelid. It will draw fluffy eyelashes. The nose, draw an inverted letter "G". Lips – in the form of eight, are arranged horizontally. Separate the upper from the lower lip with a semicircular line, 2 extreme points which are raised, that the person was not sad. Body paint in the same pattern as males, but the shoulders make narrower and hips rounded. Clothe the girl in a dress. Emphasize the lower part of the chest by means of two semicircular lines, the ends of which lift upwards. Draw the curls. Erase unnecessary construction lines that give the portrait of juiciness using paint.